Now there are several famous double acts in this world for example Laurel and Hardy, Waldorf and Stadler, Miss Piggy (mmm fine figure of a porcine beauty) and Kermit and now obviously the Dynamic Duo Yoda and Bosun erstwhile freelancers of this here illustrious tome. 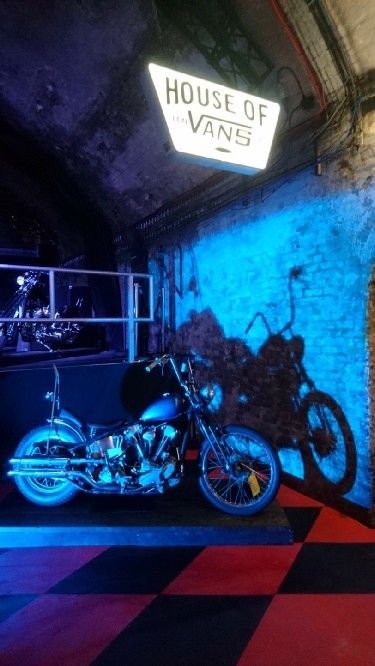 So when Yoda called me to ask “Had I heard of the Assembly Chopper Show?” a collection of some of the best chopper bikes from around the world for one weekend only in London. He then told me he was going to be brave and head south for it out of the safety zone of Birmingham where he lurks spider like to pounce on unsuspecting motorcycle events, I had to go. Especially as he had worked out how to obtain tickets for the launch night, I would imagine by use of puppy dog eyes and the venue not understanding a word our brummie friend says. Meeting up mid-afternoon we soon found the venue down a seriously cool graffiti covered underground passage, however we found the doors here barred until 7.20 when the party was due to start, but in true secret squirrel stealth mode (think more chuckle brothers) we found the front door open and so sneaked in early. Well no one said we couldn’t that’s our story and we are sticking to it. To say the venue for this event is cool is an understatement; The House of Vans is a whole series of underground vaults which house a skate park, cinema and exhibition space, a bar and food area, and for this show in each one was something cool, with row upon row of really cool choppers, apparel and photos, and the amazing thing is the show was on free all weekend. Thankfully no shop as my youngest boy adores Van Shoes and “has” to buy at least a pair a month. There were cool leather jackets and also some neat Jewellry. Now I should probably know some of the builders of these bikes, I certainly recognised a few names and bikes, but as a lot are from the hip and trendy younger builders I didn’t. It is however very positive that they are embracing the scene in such an enthusiastic way, as chopper events like the Flanders Chopper Bash, Hookup and the Trip Out prove. Certainly there were many who had ridden their bikes some way from the continent and beyond. and they kept ridding in all weekend. it wasn,t just Harleys either there were some super cool Triumphs and a Japanese 4 Digger that screamed cool. and who would ever think sky high velour seats would ever look cool again. By now most of you know Yodas love of bling and bright and shiny things and so it wasn’t too long until he was spinning around like a whirling dervish with a huge grin on his face his camera shutter finger almost aflame by the speed it was being pressed. The band was called the riddle a 60's style band who were cool looking and very loud in the tunnells. Of the bikes Yoda fell in love with a green triumph and I couldn't decide between a bobber style Triumph or the Churches Harley racer which had attitude. As it filled up we decided to sneak out again, although we had official passes as well making not quite such a stealthy exit as they had to move half the displays to let us out the door. 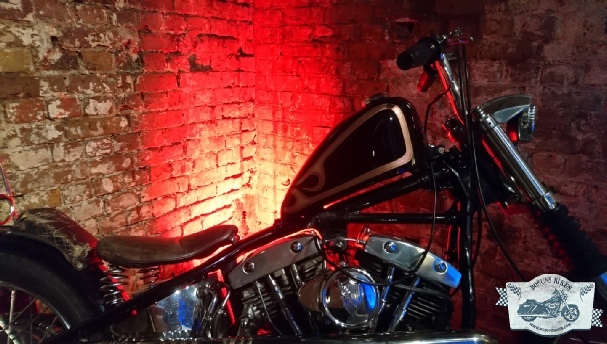 A fabulous show and some cool bikes, I think its always positive to see younger folk building and riding and more importantly having fun in a lifestyle we love, and choppers will always be cool as and its what started us in loving the scene in the first place.